FieldEdge is a simple, yet powerful field service management solution designed with the needs of home service contractors in mind. It makes it easier for businesses to sell more and save time by minimizing paperwork and providing better services. The software suits a variety of industries, including HVAC, electrical, plumbing, commercial equipment and locksmith. It helps organize offices and turbo-charges technicians achieve enhanced productivity and efficiency. It minimizes data entry by transmitting invoices right into QuickBooks, allowing field staff to go paperless while providing better services. The software provides the in-office staff with insight information into the business and makes it easier for them to make improvements and increase recurring income. It makes billing and collection faster, ultimately boosting revenues and organizational competitiveness. Previously dESCO, FieldEdge combines 35 years of industry experience with modern technology to deliver the leading field management software that’s not only easy to use, but also offers powerful functionality. 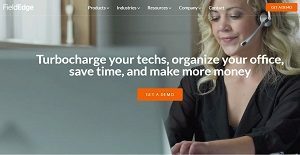 It connects the field staff with the office and makes it easier to schedule and bill jobs. Seamless integration with QuickBooks means minimum paperwork and no duplication of information. The data goes directly into QuickBooks, which also reduces time it takes to manually input data and minimizes chances of error. The mobile tools include Android and iOS apps and allow businesses to turbo-charge technicians and enable them to do more in less time for improved profitability. These tools also help transform them into better sales people instead of purely technical-staff. FieldEdge keeps everyone connected in real-time and allows dispatchers to see the up-to-date status of all work orders. The Dashboards are accessible from anywhere and provide a running overview of operations. This helps the management better understand processes and marketing activities that are working well and resulting in a better ROI. FieldEdge Office covers scheduling and dispatching, customer management and service agreements. It seamlessly integrates with QuickBooks and comes with Dashboards and powerful performance reporting tools. FieldEdge Mobile includes a mobile CRM, price presentation, quotes and invoicing and mobile dispatching. Both solutions help boost recurring income and make it easier to organize, schedule and manage billing using state-of-the-art technology. Companies have unique needs and requirements and no software solution can be perfect in such a scenario. It is pointless to try to find a perfect off-the-shelf software product that meets all your business needs. The wise thing to do would be to adapt the application for your unique wants, worker skill levels, finances, and other aspects. For these reasons, do not hurry and subscribe to well-publicized trendy systems. Though these may be widely used, they may not be the ideal fit for your specific requirements. Do your research, investigate each short-listed system in detail, read a few FieldEdge reviews, speak to the seller for clarifications, and finally choose the product that provides what you need. How Much Does FieldEdge Cost? FieldEdge Office and Mobile’s enterprise pricing data is available only upon request. Contact the company for more details, and ask for your quote. We realize that when you make a decision to buy Field Service Management Software - FSM it’s important not only to see how experts evaluate it in their reviews, but also to find out if the real people and companies that buy it are actually satisfied with the product. That’s why we’ve created our behavior-based Customer Satisfaction Algorithm™ that gathers customer reviews, comments and FieldEdge reviews across a wide range of social media sites. The data is then presented in an easy to digest form showing how many people had positive and negative experience with FieldEdge. With that information at hand you should be equipped to make an informed buying decision that you won’t regret. What are FieldEdge pricing details? What integrations are available for FieldEdge? If you need more information about FieldEdge or you simply have a question let us know what you need and we’ll forward your request directly to the vendor.